You would think that me being from Texas, and Papa being all about the hunting, that The Husband and I would be knee dip in camouflage, but nope, we're not hunters. But somehow we still found ourselves at a hunting exposition in Texas (a friend was putting it on), which was kind of fun for The Husband, he got to play with guns for the day. They even had pink ones for girls (or for boys who happen to like pink). 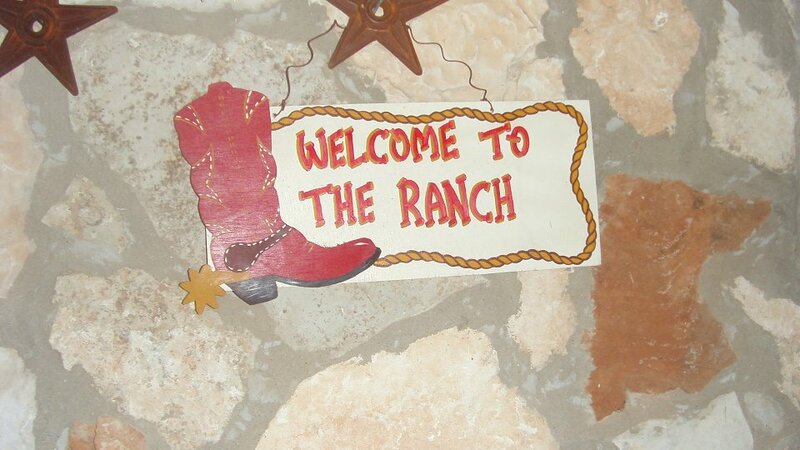 Then next day, we went out to the ranch so The Husband could play with some guns for real. But first I needed to feed Kelly. Kelly is a deer that thinks she's a dog. Although I'd never let Fifty eat out of my hands like that. He doesn't have Kelly's impeccable manners. 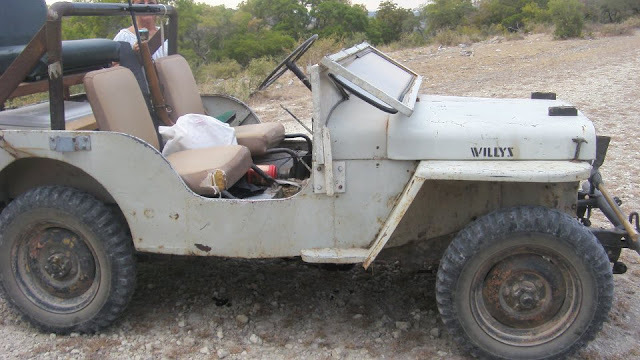 We loaded up the old Willys jeep (aka The Nazi Hunter) and headed out. Love The Nazi Hunter, but loving The Nazi Hunter means you have to love all of it. Even it's popping out of gear when you're almost to the top of a steep hill. Not that it's not fun sliding back down the hill, it is. But then you get stuck in a ditch and the tires spin, spin, and spin, and you begin to think that you're going to be walking all the way back to the ranch house in 100+ heat and that wouldn't be any fun at all, but then The Husband comes to the rescue jumping on the hood to add a little weight to the front tires. After the rescue, The Husband did some target shooting for the rest of the afternoon and I hung out with Kelly, covering her little deer ears while the shots were being fired. I wish someone had covered my little ears. And you know what else isn't too shabby? Is that first picture a gun-shaped barbecue? cause I titally want one. In pink. First, I think you could have combined some guns with the pickles and ice cream purchases from Wal-Mart, no? Last I checked that's where folks buy guns these days ;) Second, when do you get fun glasses? I love them! Love these Tejas-related posts! Too fun for words!! YAY! So glad you are enjoying Texas with the Hubs :) My Dad is also an avid hunter although I'll never shoot an animal ever! Kelly is adorable, I want a Kelly...and ahh, nothing like a Texas sunset. Can't believe Kelly just stands there while they fire! Ears covered, or not! That has got to be the definition of "tame". She's beautiful, tho. Too bad you couldn't take her home. Those Texans love their guns. I have never seen a pink gun before; I guess only in Texas. I am obsessed with Kelly the deer. Growing up, we had a goat like that out on the ranch. Her name was Laverne! And for reals, can't beat a Texas sunset! oh my gosh, pink rifle..that is awesome. UM Kelly is the best pet ever! I'm going to show this to my bf to convince him a deer is a much better option than a puppy. Beautiful sunset! We get deer in our backyard all the time. But they look emaciated. I'm afraid if I tried to feed it, it would bite off my hand - haha. Looks like y'all had a blast out there! And I need a pet deer.